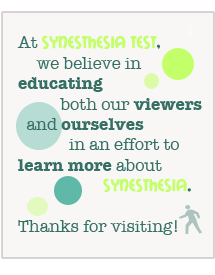 Since we launched Synesthesia Test, we’ve had a number of visitors (synesthetic and non-synesthetic) share their experiences with us. Collectively, these shared experiences are a testament to the beauty and mystery of the human mind. We’ve heard from teenagers expressing concern for their unique perceptions. We’ve heard from middle-aged parents learning about synesthesia for the first time. Often, the common thread is relief. Now, we’d like to share these synesthetic experiences with all of our visitors. Let this vault of shared experiences show that one man or woman’s “weird” perceptions are not necessarily his or hers alone. Often times, these perceptions are shared by many. When one student asks a question, many students get an answer. 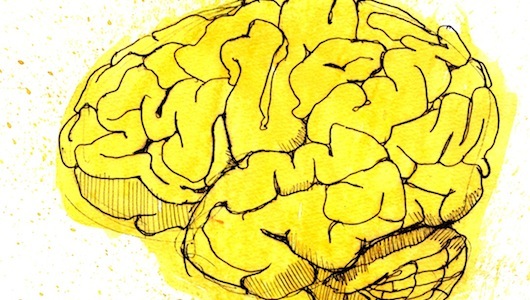 While we can’t verify that any of these experiences are exclusively synesthetic, we can be sure that both synesthetes and non-synesthetes will contribute. We’ll do our best to vet submissions, but our hope is that this vault will benefit a growing community of curious individuals. To submit an experience of your own, use our contact form; put ‘Synesthetic Experience’ in the subject line. We’ll never publish an experience without the contributor’s permission, and we keep things anonymous (using first name only). As it stands, these are listed in no particular order. As we list more experiences, perhaps we’ll provide some organization. Enjoy! I have the personification type of synesthesia and I’ve had it for as long as I can remember. For me, every color, number, letter, day of the week, month and season has a very specific personality, gender and age. What’s interesting is that the characteristics have never changed, even as I get older. For example, the number eight has always been a middle-aged, know-it-all woman who thinks she’s better than the other numbers. Brown is a young, introverted boy who’s always a little sad and has a self-esteem problem. I always thought others had their own associations and didn’t realize it was synesthesia until I was in my mid-20’s. I think it’s kind of neat and can’t imagine not having it. Letters, colors and numbers in particular feel like actual people to me and are as cemented into my mind as a real person is. I’m not artistic at all and am very analytical and slightly type-A. I have two small sons and both of them have exhibited interesting sensory needs in a physical capacity, but I can’t tell yet if they also have synesthesia. As far as I know, no one else in my family has synesthesia. I grew up assuming everyone had this sensation, but after explaining it to a few people, I realized that it was unique. I feel a shooting pain from the heel of my foot up through the back of my thigh when I hear about or see something painful. I grew up assuming that this sensation is what people meant when they referred to a “sympathy pain.” I feel sharp, shooting pains when watching someone cut steak, or watch a horror film, or witness a child fall down. While I always feel it in the backs of my legs, it sometimes occurs locally, as well. If someone has a hang nail, for example, I’ll feel a pain in that area. I feel like it makes me really sympathetic of others, but it certainly has effected me negatively in the past. It was excruciating to be in the room with my father after his heart surgery, and it made anatomy class dissections impossible for me. I also experience a physical sensation to both my own emotions and the emotions of others. If I see someone crying, I feel something similar to “butterflies” behind my knees. A similar butterfly feeling occurs over my sternum when I witness laughter or happiness. I taste certain colors as well… I hated my first lemon bar because it didn’t taste like the sun. And I have color and image associations through flavors to sounds or images… For instance, if my bird screams I “taste rubber band…” not the physical rubber flavor, just whatever it is that my mind considers “rubber band” to “taste” like. And certain words have a flavor, feeling, and sound that I experience in my mouth. If someone says “heart” (I reminded myself of this mentioning my father’s heart surgery) I taste, feel, and hear what chewing on “heart” would taste like… that probably sounds more serial killer-ish than I’d like… But it’s incredibly difficult to explain. I have had this all my life. For me I have the color and spatial synesthesia. The letters and numbers, weekdays, months. Also peoples names. Letters and numbers don’t have personalities but are felt as positive, negative or neutral to me. Certain sounds are felt on specific parts of the body, but not all sounds. I hate this, because it’s particularly noticeable when it’s an unpleasant feeling. It’s enough that I have to get up and move positions. This doesn’t happen often, but enough that I remember it. Music has feeling to me. Time is extremely detailed to me. My time is very mapped out. I can easily see how dimensions play out on one another. I think of months and the year in color and a special loop around me with slight tastes, like November has a dusty taste, May tastes like pine. I think of all of time in general as “the great ladder” and it is suspended in 3 dimensions in black space. It is vertical and the years are on each rung, with the present on the top rung, the past below. It reminds me of DNA models. When it gets too far back in time down below me, time puddles in both directions and is more unstructured-pyramid shaped with the ladder balancing on top. Each present year is always in a spatial loop with September being at 12 o’clock and December at 6, July at 3. In addition to seeing each month in color, I also see it as alive with flora/landscape and slightly animated. I have always wondered though why my time-ladder is in greys and black/white, but when I think of a certain decade or period it becomes colored. I have come to think the whole ladder would system overload my brain if in color/motion. What a wild ride! I cannot imagine not experiencing this. Whenever I recall or think any words they, also, show up on the screen. Poetry is the only instance in which multiple lines will show up on the screen, if I visualize two or three at a time; otherwise, it is always the one-line ticker tape. Hearing music also causes me to see the shape of it, as sheet music; the better I know the song, the more detailed the projection. At times I have been able to remember the shape of a once-heard song, but not the sound. My mother and sister have similar perceptions but they are not as persistent as mine; for my mother, it only starts up if she thinks about it, and then, like the old game “Whatever you do, don’t think of a pink elephant” she can’t turn it off again, until she forgets or gets distracted. I also have a more common spatial-numerical form wherein months appear in an oval (not evenly spaced: June through October occupies the top two thirds, with August 1 at the very top) and years appear in columns, by decade (until my lifetime: I was born in 1996, and so the 1990s continue downward in one overextended column to the present). I associate music notes / keys with colours, but it’s far stronger on some notes more than others. F or F major is a pink sunset, whereas G or G major is a general purple or green colour. It’s really bizarre – I think I’ve always had it but I didn’t know it was called synesthesia until a few weeks ago. I also have perfect pitch, and although I don’t tend to use synesthesia to work out what the notes are, I see colours anyway with the note name. It’s never been useful, just quite interesting! I’m 14, and for a long time I never considered I might be different. I’ve always seen the alphabet as a green and yellow pyramid, seen numbers and letters as colours, and thought that the letter “M” could not be trusted. It was only a couple of months ago, when I read the book Ultraviolet, that I suspected something was up. The protagonist of this book talked about the colours of words, and I started to think things like “No, Monday is blue,” or “But Racheal is a pink name”. Later in the story, when she was diagnosed with synesthesia, I realised I might have it. As a test, I asked my mum what colour a certain word was. She told me straight off that it was yellow, which was a surprise. It was orange to me. A few minutes of online research told me that synesthesia was inherited. I then talked about colours to both my parents. My dad found the whole idea strange, saying that “words are just words”. This confirmed who had passed synesthesia on to me. I’ve done several online tests, which proved I wasa synesthete, but to what extent, I don’t know. As well as seeing words as colours, I can also pull up an image of a place in my head- e.g, my house- and walk through all the rooms, knowing exactly where everything is; although I’m not sure if thiis synesthesia. I also see the year as a long line, and as a result, I can jump to dates in my head. I’ve been accused of lying several times by people at school, and some think I have a mental illness. But I now have a good comeback for those people: “Your name is a horrible colour”. I think I had Synaesthesia to a larger degree when I was younger. Back then I remember seeing certain motions and also seeing pink. Ever since I can remember, the whole alphabet has certain colors, along with numbers. If I focus on my minds eye, I can associate music with colors (I have no knowledge of which note is which, so I wouldn’t know if there is a color for each note). I can also taste colors, just by looking at them. Certain sounds, such as the dog barking, makes me think of certain shapes and colors. Not every color has a taste to me, but green has a very definite and wonderful taste. Cucumbers taste green always … and so do green beens, but not becasue they are green. I If I tasted summer it would taste fresh and amazing like the color green. Summer is not green though (just June), to me all the months have a color. The only other color that has a taste for me is red. It is disgusting. But I don’t know what food in particular it is associated with, just if I tast something really bad and bitter, it tastes red. The other thing I notice is that the year is a physical shape, as do each month and the week’s within. At my old job, I would plan out events and I rarely had to look at a calendar, because I could just “look” at the pattern and shape of a month and the weeks within and I could just count it and quickly figure out what date I was looking for. I’ve never really thought much of it because it just seems like a normal thing to me. I know that something isn’t, well, normal in my mind’s eye. I know that I am a synesthete, but to what degree, I have no idea. It is always a positive experience and I do not wish to interpret the world in any other way. At all. But when I cannot project anything accurately to others, though I do not question that it is accurate in my mind, it gets frustrating. And it gets lonely. I am tired of this barrier between the way that I experience things, and the way others do. But I do not want to get rid of it or dim it down or learn to control it or what have you, because it shows me how beautiful the world is. I just wish that everyone else would see it, too. I have a few forms of synesthesia but I can’t find any discussion for some of them online. About two years ago, after watching a documentary about synesthesia on the discovery channel, I first realized that reading letters and numbers with colors was a rare trait which I had. Not even just letters and numbers, but in my concert choir and concert band (I play oboe) classes the notes on the music sheets are also colorful. I can’t hear colors, only read them. Over the next few months, I gradually started to discover that I had more synesthetic traits than I thought. After truly realizing for the first time in my life that not everyone can read colors, I noticed that my numbers 0-9 and a few letters have their own developed personalities, but reaserch told me that these are considered common within people with synesthesia. About two months ago I began dating my first boyfriend. This may seem irrelevant, but me being only 16, this is an emotional milestone. For our first date, we went to watch The Hobbit in the theatre. Partway through, my entire field of vision sees nothing but a vibrant pinkish-purple color for a few seconds. This startled me since nothing else was visible, even though my eyes were opened and focused on the movie. A few minutes later, once I had forgotten about the strange occurance, I once again had the same pinkish-purple take control of my vision. This time I waited. When it happened again I realized that the cause of this color was in fact my new boyfriend lightly kissing my hair. I had forgotten about the movie now and focused on my new synesthetic experience. This ended up happening 6-7 times, each time like the first, but with less confusion. Once I arrived home, I once again reaserched synesthesia, but the only information I could find on touch-to-color was whenever it was casually mentioned in a list. A little while later while cuddling, I noticed that when I closed my eyes, places like my feet, shoulders, stomach, and my back would almost illuminate in a way with a specific color in my mind. This brought me back to the movie date and made me wonder why I had to close my eyes this time to “see” the colors, since last time is was overpowering. Perhaps it is emotion-to-color instead? Or maybe a combination of touch/emotion-to-color? There isn’t enough information and background on the Internet for me to answer that. I thought my synesthesia would stop there and I wouldn’t discover anything more bizarre. Nope. This last one took me the longest to realize to be another part of my mixed senses. I was surfing the Internet and came across a cinema graph website. A cinema graph is a still shot photo with one moving part to it, ex: a picture of a candle lit dinner with nothing moving but the flickering candle on a video loop. I was immediately intreaged by the motions… and the sounds they made. None of the cinema graphs had audio to them but I could clearly hear the motions being played out. This blew my mind as I sat and reflected back throughout my entire life. For as long as I could remember, anytime I saw something swaying, rolling, or moving in general, my mind would automatically match it with a low monotonous sound. Even the blinking blue bar that marks where I’m typing as I’m typing this has a very clear “drum beat” to it. I was sure google couldn’t give me any information on this form of synesthesia. After thinking for a while, I concluded that the reason this form had gone unnoticed for longer than the others is the fact that it is impossible for me to rationalize a separation between motions and sound. My mind is not able to imagine a movement without pairing it with a sound. I spent my childhood believing that this was normal, and nothing to think twice about questioning. Even now, I can’t imagine a world without being able to hear complete silence. Overall, I can’t imagine a world without synesthesia. In two weeks I’ll be 64 yrs old. My entire life I’ve wondered why people didn’t understand all the things I understood so easily… and I also felt bad because I never fit in and I always thought outside everyone else’s box. I’m so glad to be validated by synesthesia! I feel like my pieces are finally becoming ‘glued’ together. I am also lulled by watching another person’s massage or someone else’s hair being styled. I touch everything fabric and instantly know whether or not the item is ‘friendly’. I have an extreme sense of color that enables me to assemble or disassemble a color (discern components of the main color). When I was a toddler perhaps aged 3 or 4, I asked my mother what her colour for some word was. I remember having the conversation as does my mother. She immediately replied and gave a colour that did not match the colour that I saw for that word. That in itself was a revelation and during that conversation I/ we discovered that my mother’s world saw a completely different spectrum to what I saw, although neither of us knew it was odd in the slightest. My mother had never discussed it with anyone before, certainly not me, my father was blind so he didn’t comprehend colour in any sense. My mother and I assumed that everyone who was sighted had the same experiences, and we didn’t feel any need to talk to anyone else about it, I was satisfied that I was ‘normal’ because mum saw the world of colours too. I see colours in numbers, words, letters, shapes, textures and to a lesser degree, sounds and smells (at least they aren’t so clearly defined as the other elements are) and I have such an aversion to certain foods because of the unpleasant colours, their smells and tastes illicit. Just a few years ago, I read a newspaper article which gave this experience a name. I showed it to my mother and this was the first time either of us realised the uniqueness of our lives. At this point none of my siblings (now adults) when asked, could fathom what mother and I were talking about. I was disappointed to find that of all my many nephews and nieces, as they became old enough to be asked, none appeared to have their lives enhanced by synesthesia. And none of my other relatives, friends, colleagues or acquaintances confess to having synesthesia. Until today. My 4 year old nephew, I decided, had developed enough language skill to do a random unscientific test. Five months ago I had asked him what colour two words were, and he answered, but I couldn’t be sure he wasn’t just messing around. This time (with no interference around, and no repeat of those same questions in the interim ) and without giving us any hint of being confused by the question, (the other cousins had previously been very perplexed when asked,) he answered right away. I ascertained he has colours for months, names, days of the week, letters and numbers, as his grandmother and I do….but again a different spectrum to either of ours. Neither of his parents are synesthetes. I didn’t go further than that. And his answers matched what he had given some 5 months ago when I had asked him for the colour of two random words as a quick pre-test. Only this time for one question he answered Green, when previously he had said Blue, and I was disappointed at first, till without prompting he clarified and said “well actually more blue really” which indicated to me it was a shade which he doesn’t yet have the vocabulary to express. A precise colour shade that he sees. Certianly not something an non-synesthete 4 year old would have given as an answer. His grandmother was watching from the other side of the room and didn’t say a word at this conversation took place. Later she confessed that the speed with which he answered, the confidence he showed in his answers and the fact that just hearing the questions didn’t phase him at all, probably means we have a kindred spirit in the next generation too. I am thrilled for my nephew. I think my life is so much richer for having synesthesia, I can’t imagine or comprehend how anyone’s life can be without it, any more than they can probably understand my world. It’s a fascinating subject to me, now I know most people don’t see things as I do, because synesthesia is in everything I am and do, I wonder how non-synesthetes cope. I am a 21 year old female and for as long as I can remember I have associated colours to people. It wasn’t until a few years ago that I discovered that not everyone sees this. In fact I have not met anyone else who does. I never mentioned someones ‘colour’ to them, because to me it seemed like pointing out the colour of their hair; how obvious is that? It wasn’t until I made a passing comment one day to a friend about their younger brothers ‘colour’ and they had no idea what I was talking about that I realised that not everyone experiences this. I have since tried to do a bit of online research on this ‘thing’ I have and have been able to find a bit of information relating to Synesthesia as I also see colours in letters, days of the weeks and numbers, but I cannot find much at all on seeing colours in people. Hi, I’ve been trying to learn more about this condition since I’ve recently discovered that I have at least one type of synysthesia. I forget the exact name of it, but I see the days of the week as certain colors. I was wondering, though about the months: I only have colors for a few months; February is yellow, April is purple, January is pink, etc. But I don’t have colors for other months. For instance, March is a “warm” color, in that it fluctuates between different shades of pink. August changes between green and yellow. I’ve heard here and elsewhere that synysthesia is defined as *consistent* stimuli, so I was wondering where this would fall into that. The same thing is true of sounds, albeit a little different. I play guitar, and whenever I play a certain chord, I “see” a certain color in my mind’s eye, and also usually have some sort of emotion. However, when I’m listening to music, I very rarely have these sensations. It extends to other sounds too, but here’s the hang-up: I don’t always see the color. If I hear a sound, it brings up a wealth of other information; location, noise, etc., but also how pleasing it sounds. I’m a musical person, and I, for lack of a better term, “musicify” most sounds I hear. When I’m thinking about that stuff, the color and emotion isn’t present in my mind. However when I’m not thinking about that other type of information, I do experience these feelings. I’m a little confused because it feels like I’m trying too hard to conjure them up, but at the same time it’s really rather natural. The things I’m describing are consistent within themselves; April is ALWAYS purple, January is ALWAYS green. A C chord is always orange, and warm, and a D chord is always purple, and a little sweet. I just have to “pay attention” to those sensations. It was the first day of 6th grade and our Science teacher told us each to write down on a piece of paper what the word science made us think of. A lot of the children were writing down ‘obvious’ things: Chemistry, Physics, Albert Einstein, blue liquids of sorts. I thought of it for some time, and then wrote down what that word made me think of. I brought my piece of paper to the teacher’s desk to show her what I had written down. Upon discovering I had written the ord ‘purple’, she looked at me oddly. “Purple? !,” she said, a confused look on her face. She had never seen such a thing from her students, even though she made students do this every year. “Yeah,” I said. What was the problem?, I thought. I had no idea why it was such a big deal. After all, she had told us to write down what it meant to us. I had always had a feeling that my synesthesic experiences were a little unique, yet I was pretty sure most people had it to an extent. Of course, “most people” meant my mother and my sister, who experienced it to a degree, since I hadn’t discussed the topic with my friends or classmates. Growing up, I had an very good visual memory — and, to this day, I remember most things via visual memory. I have the ability to visualize things very well in space. For example, I “live” in the calendar in my mind. As the month changes, I change spots, and I can go from an orange October to a dark blue-grey November. My months have colors. My years do. My days of the week do. My numbers do. My letters do. My words do. For some reason, as my synesthesia is associative, I see my words in Helvetica against a white background. The colors aren’t constrained to their letters, they can influence other letters, they glow, I suppose. Now, of course, some other things can influence a word or a number’s color. I also don’t like certain numbers/letters/days/etc because of their color. For example, I hate T’s, which is unfortunate because that’s the first letter of my last name. I like P, a fire hydrant red, which is lucky, as it’s the first letter of my name. I could ramble about my grapheme-color synesthesia for hours, but I will spare you that. I also have different, although diluted, types of synesthesia. Some sounds make me cringe, even some ordinary sounds. Or when someone shows me an injury I get a terrible feeling throughout my body. Synesthesia is part of my everyday life, and it helps me remember things, too (grapheme-color). I consider it a gift of sorts. I recently got asked by someone if I have synesthesia. I’m not sure. I wrote about a sentence that it came off as blue/green, my short hand for depressed/sad. Thing is, I don’t see colors with words. It’s more that I mentally hear music when I read sentences. I do it with images as well. A comic page for me is a symphony of musical sensations, if done right. Done wrong, it’s like someone scratching a blackboard with fingernails. I can actually tell is an author is a good or poor storyteller and read all sorts of information from the music, including the emotional state of the author in the music I ‘hear’. I don’t exactly hear it either. It’s not like I look at a sentence and hear music, but rather pressures and sensations which I associate with music because I feel them when listening to music too. This sentence has a rhythm of five beats and a grey/yellow texture to it. The author is setting things up, which is why the neutral color. He is accustomed to older English forms. Rhythmically, to break it down, it starts _ _ – _ _ – _ – _ – And I actually see that as a sort of ‘aura’ around the words and letters. I’m not sure if all of this adds up to synesthesia, but I do know that it got me wondering if I have synesthesia.